Anyway, back on topic; no visit to the range for me this evening. I'm going to make an early morning dash on Sunday instead. Did he? OK, if it's his fault I might have to increase his smite tally a bit! No visit to the range tonight huh? Well if the weather is as bad where you are as it is here, staying indoors is the best option!! staying indoors is the best option!! It's far worse than that. Christmas shopping!!!!!!!! Bloody hell......ain'tcha ever heard of ebay? Yeah, but the wife hasn't! Well get on there sharpish and change her passwords!!! I got to the range on Sunday morning. I was shooting a mixture of JSB Match Exact and RWS Hobby (those what have the flat head (like my Uncle Mike)). 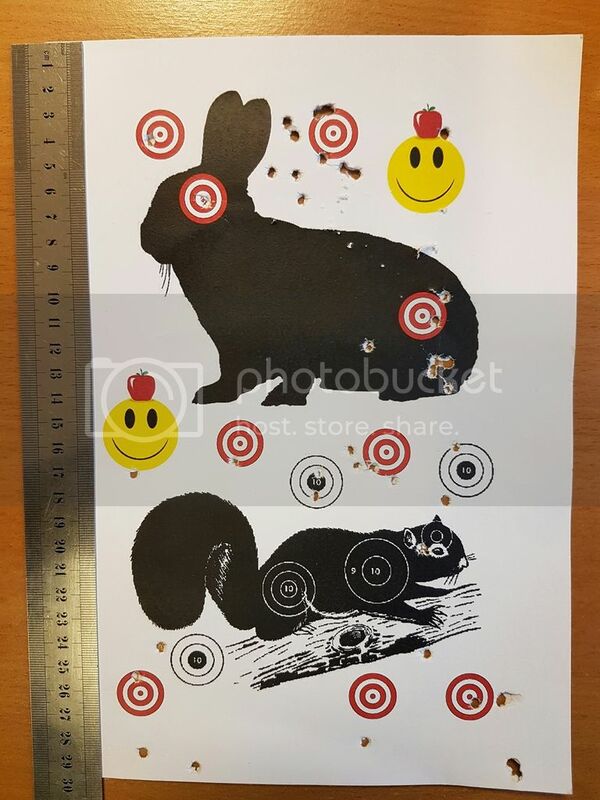 I did a mixture of the usual plinking at spinners and whatnot and targets at 30 yards. 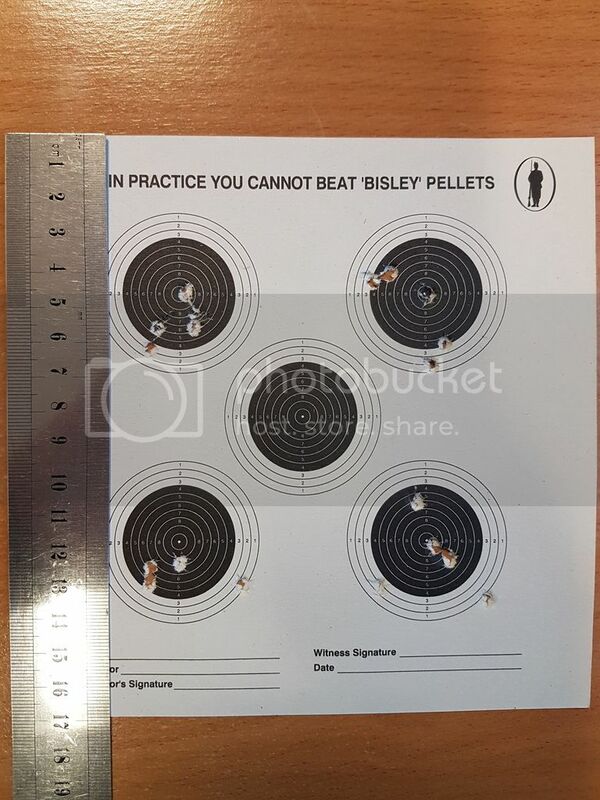 Before I get to the targets I'd like to mention a special moment that I had after 10 minutes of plinking, before I'd put my first targets out. There's a 20cm x 20cm metal plate at the end of the range (35 yards away) and it has a little (approx. 5mm) hole drilled in the centre (@ Barry in IN - note the CORRECT spelling of "centre" there) and behind that hole is a bell. "What the Hell," I thought, "Have a go." First shot; low and right. Second shot; slightly high. Third shot; ON THE BLOODY NOSE!!!!!!! I nearly jumped up and did a dance but settled for doing a small, one-man Mexican wave with myself instead. 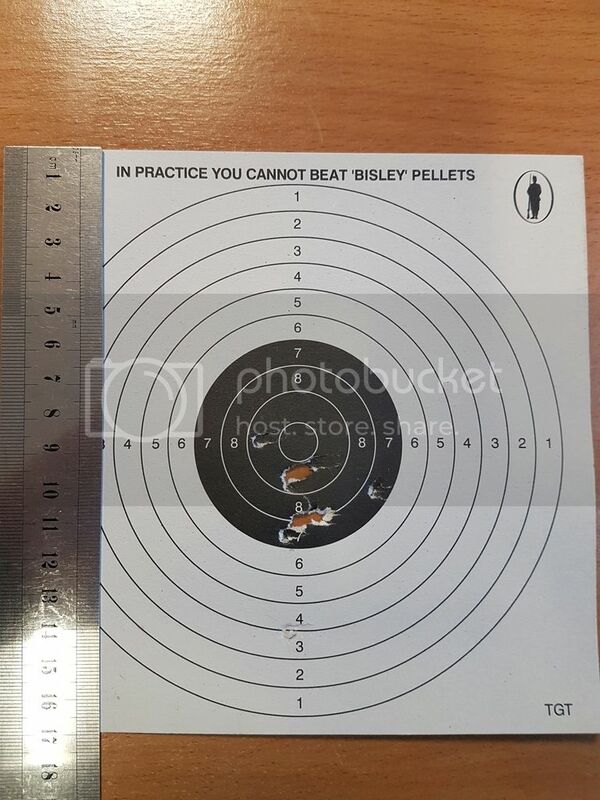 Now you may be thinking "Lucky git" and you may be right, but my zero is at 30yards and I prefer to think that I considered the correction I needed to apply for each shot to hit the target and that my process proved to be fruitful. Lucky or not, I stopped trying after that; quit while you're ahead, Blerk. First one : 10 JSBs in the black but generally high and left. High and left has been a bit of a pattern so I thought I'd tweak my scope dials. Third target : 9 out of 10 JSBs in the black (God knows what happened to that little bugger down at the 6 o'clock) but too low. I've lost height!!!!!!! Fourth target : Change of tactic here; 5 pellets at each of the outer targets. But notice the two bullseyes! Fifth target : I'd had this little beauty up all through my session and had been going back to it throughout. Notice the group low and left of the top, right red target? That's the Hobbys. Notice the clean kill on the bunny? That's a JSB, shot fairly on in the session. So, what did I learn from the targets? 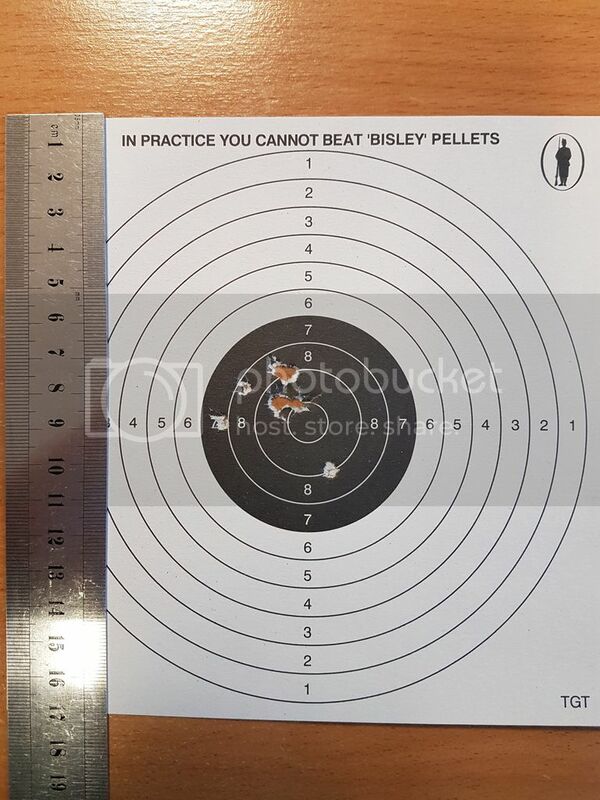 The Hobbys tend to go low and left BUT if I change pellets too often I lose consistency anyway! There are so many variables when shooting a springer that consistency of setup, settings, pellets and technique seems to be a key issue because they are the things you can control. I can't comment on your shooting as such cause it seems you're up and running,all I feel I can say is 'the more you shoot,the better you get'. In reference to your comments about AO scopes- about parallax, or to put it crudely-focus. We don't know what your scope is focused at-so for you to work this out it's quite simple, set your rifle on something stable so it can't move around ,then without touching the rifle look at what's in the crosshair and move your head about, you'll see all the image shift about. Do this at various ranges until you find where the crosshair doesn't move and this is the 'focus range' or where it's said to be parallax free. It can change at different magnifications. Your px can be reset manually but it can be fiddley or a downright pain if you're not used to such things.But that's another story..
Thats not too shabby mate. Like nic said keep up with the practice and you'll get there. 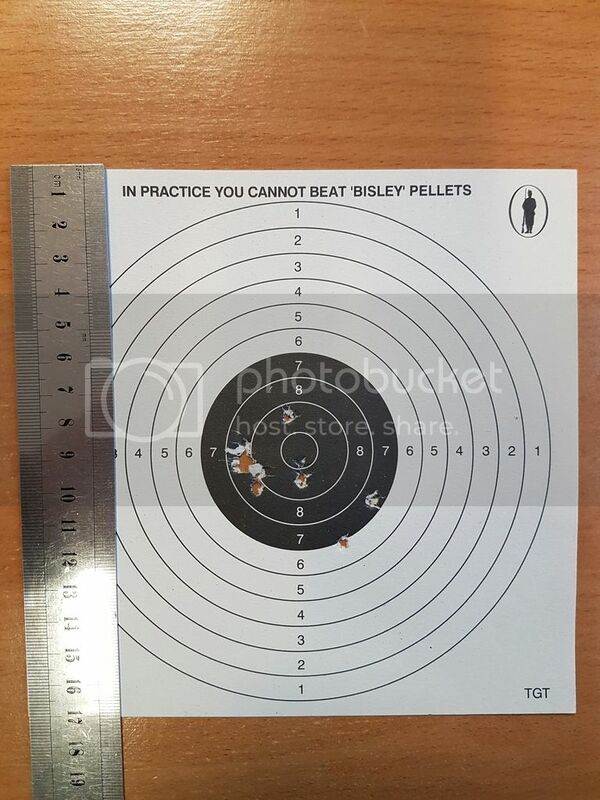 Or get a pcp hit pellet on pellet end up bored senseless then put the rifle in the cupboard for a few years i stopped going to my local club down to these facts. I need to give my head a wobble and get down there more often with a springer and only take the pcp's to check its performance. Keep at it mate.